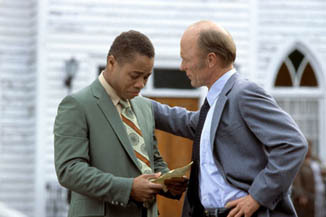 Cuba Gooding, Jr. continues his busy year, playing the title role of James Robert "Radio" Kennedy, a mentally challenged man who is befriended and mentored by the local high school football coach (played by Ed Harris). The film is based on the real life of Kennedy as reported in a Sports Illustrated article by Gary Smith. The screenplay was written by Mike Rich, who wrote last year's The Rookie, which was based on the real life story of baseball pitcher Jimmy Morris, so Rich is already making a career of writing based on a true story sports scripts. Director Michael Tollin is also responsible for Summer Catch, so he pretty clearly has a less successful track record with sports movies.